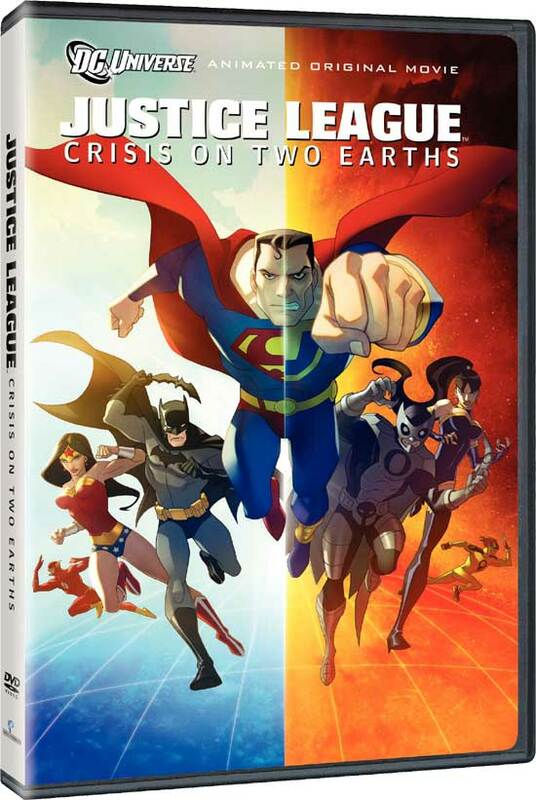 Justice League: Crisis on Two Earths is the seventh in the "DC Universe Original Animated Movie" series. It sees the usual JLA crew of Superman, Batman, Wonder Woman, The Flash and Martian Manhunter travel to a parallel Earth in order to help out an alternate Lex Luthor. The latest in the DCU:OAM is by far the best of a good bunch. The film is somewhat loosely based on "Crisis on Earth Three" from Justice League of America #29–30 published in 1964 and Grant Morrison's JLA: Earth 2. The story begins on a parallel world in which Lex Luthor and The Joker, alternatively named The Jester, are heroic figures on the run from the "Crime Syndicate". 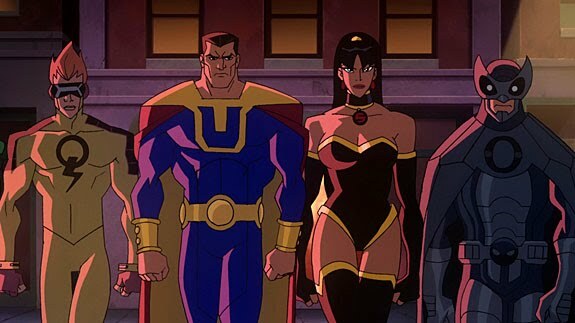 The Syndicate are a Bizarro version of the Justice League led by Ultraman (Brian Bloom), an evil doppelganger of Superman. Lex makes his way to the DCU to plead with the JLA to assist in removing the Crime Syndicate from their position of power as overlords on his home world. I won't go anymore into the story, I'll leave that up to you to explore fair reader. 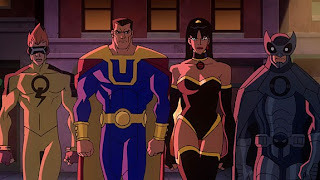 Dwayne McDuffie was the writer of this project, a name well known in animated circles as the writer of the Justice League TV series, Ben 10, Teen Titans, Static Shock and the upcoming All-Star Superman. The story is good fun but it should be noted that this film is in a completely different continuum to Justice League: New Frontier. 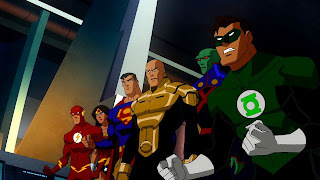 This film is more closely related to the Justice League and Justice League Unlimited TV series where rumour is that this film was to act as a bridge between the two series. Sam Liu sits in the co-director's chair alongside Lauren Montgomery, both prolific directors in the DC/WB universe and both currently attached to next years Batman: Year One. The position of voice director is filled by the Queen herself, Andrea Romano. She assembled an all star cast including James Woods as Owlman, Chris Noth as Lex Luthor, William Baldwin as Batman and Mark Harmon as Superman. The stand out performance overall would be that of James Woods who plays Owlman as a calm, creepy sociopath. The animation in this film is undoubtedly the strongest of all the DCU:OAM differing slightly from the look of previous films. The JLA are still all presented in their classic outfits based on designs by character designer Dusty Abell. Abell was also the character designer for Batman: Under the Red Hood. I could only get my hands on a single disc DVD copy of the film which unfortunately doesn't contain any special features except for a look at previously released DC films including Batman: Under the Red Hood and is also missing the "Spectre" short and Justice League TV episodes which are on the Blu Ray version. Warner Bros and DC are going from strength to strength with these films and have a great deal more in the pipeline including Batman: Year One, All-Star Superman and Green Lantern: Emerald Knights and Superman/Batman: Apocalypse which is set for release on November 3rd. 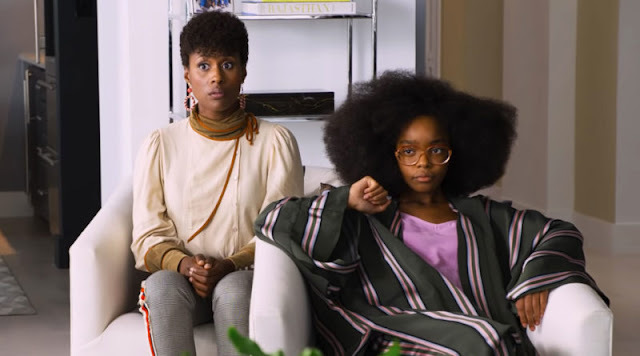 Each film that comes out is better than the last and only gets me more excited for the next!